Since launching in Piccadilly Arcade back in 2016, Be At One has become a signature serve for Birmingham’s bar scene. 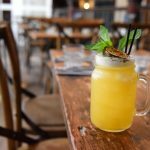 Attracting over 30,000 customers a month, it is a cocktail-connoisseur’s dream destination, with 101 drinks on its extensive menu – from and a Kiss from a Rose to a Cinema Club, a creamy popcorn sensation and the Sweet Pea which is 100% vegan and tastes like a garden in a glass! Alongside these your Be At One bests will be taking up residence at Brindleyplace. Those in the know will also be pleased to hear that Be At One’s most popular cocktail, The Pornstar Martini will also be available at the new venue subsequent to its launch.